3 Electric vs. Manual Recliners: Which One Is Better? 4 Sleeping in Your Recliner: Are There Any Health Benefits? 4.2 Is Sleeping in a Recliner Bad for Your Back? After dogs, recliners have likely been man’s best friends for a little over a century. There is nothing better than coming home after a very long day – and then sinking into a comfy, reclining chair that reminds you of a puffy cloud in heaven. Granted, not all recliners have been nice and puffy from the very beginning; some may have been actually very hard to sit on. Only the fact that they reclined was pure bliss. However, did you know that recliners nowadays have perfected the technology-meets-comfort aspect? So, if you are looking for the most comfortable recliner, then you have come to the right place. With this article, you will be able to find the perfect recliner so that you can spend the remainder of your day in peace. If you are looking for the ultimate recliner that will also look fashionable in your home, then the Mac Motion chair will certainly prove to be a great investment. Covered with top grain leather and with a sand and walnut finish, this is the perfect addition to your living room. Featuring Lumbar support, this chair is perfect for those that have problems with back pain. 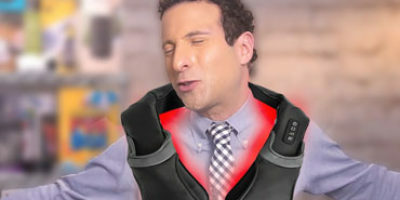 Plus, considering that it had head support, it is perfect for those who want to take a little power nap on a tiring day. It is also a good choice for deskwork, considering that it is relatively compact. This recliner also features a 360-degree swivel and can reach a 45-degree recline. While it cannot go into full recline, it is still a chair that will allow you to take a proper nap. 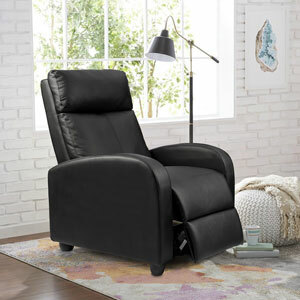 Plus, considering that it comes with an ottoman, this swivel recliner is all that you might need for a relaxing day. If you are looking for the father of all comfortable chairs, then this one is certainly the one that you must go for. 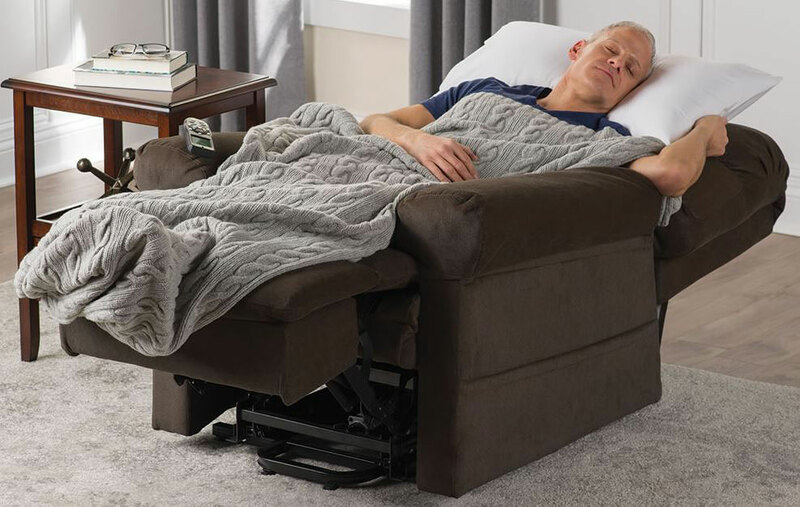 This dual motor chair lift recliner will allow you to ease your back – and also elevate your legs so that you are all nice and comfortable. The brown upholstery is very smooth and stylish. Plus, considering that is it made from faux leather, it is also very easy to clean. Unlike microfiber upholsteries, this one does not absorb stains – and all you will need to do is swipe the place where the substance spilled. This recliner is generously oversized and can even fit bigger people. Plus, considering that it can go into a fully reclined position, you can also use this chair to get a good night’s rest. It’s highly cushioned, so you will definitely be able to sleep comfortably in it. If you are looking for a recliner that both lowers and lifts, then this model is certainly the one for you. This way, when you want to easily get up, this recliner will push you upward – taking away most of the effort from your part. It is a good option for the elderly or those who have problems lifting themselves from a seated position. Featuring two remote controls, this recliner is very easy to use. By just pressing the right button, you can control every movement – from the backrest and the footrest to the full lift of the chair. It has also been equipped with cup holders and pockets so that you can easily store items safely on the chair. 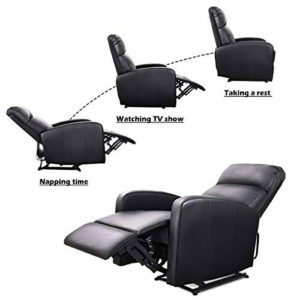 This recliner also comes with a massage option that has 5 total modes: auto, pulse, wave, press, and normal. Plus, you can choose the areas that you want the massage to focus on (back, lumbar, thigh, and legs). It is the perfect recliner for those who want to completely relax after a long day. Those looking for a chair that is both utterly relaxing and easy to adjust might take an interest in this chair. Featuring a dual-function motor that controls the backrest and the footrest, this chair is easily sent into position. Considering that this recliner is generously cushioned with plush, it is very comfortable to sit on after a long day. Some would even say that it is more comfortable than a bed, thanks to its back and neck support. So, it is a great choice for those who have back problems. 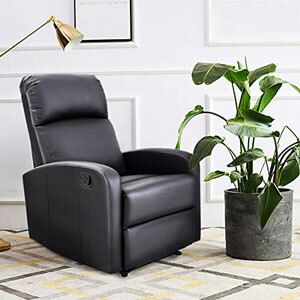 Featuring a sleek and modern design, this recliner is perfect to be used at home – but also in a business-like environment. The upholstery is made from an easy-to-clean material, protecting it against any stains caused by spills. If you prefer the manual recliner to the electric one, then this model is certainly an option you should check out. Featuring a foldable design, this can become the perfect napping place for those who want to get some shut-eye. Plus, considering that this chair has a capacity of 250lbs, it is perfect for people who are overweight. This recliner has been thickly padded to provide ultimate comfort. The backrest is also decent, and the headrest is perfect to provide support for your neck. It is a great way to release the pressure of your strained muscle. 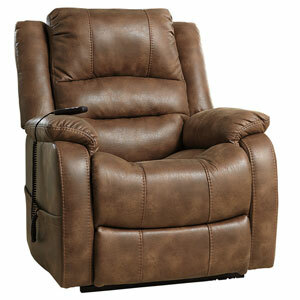 Featuring a quick switch design, this recliner only has you pressing one lever in order to go into reclined position. All you have to do is click that switch so that the backrest reclines and the footrest goes up. If you are looking for a good recliner on a budget, then this is certainly the one for you. Made with a “tall and big” design, this chair is once more perfect for those who need some extra space during their relaxing time. Upholstered with high-quality PU leather, this chair feels good on the skin and is easily cleaned or maintained (depending on the circumstance). Aside from its standard position, this recliner has two more reclining modes: a partial one that is perfect for watching TV or relaxing, and a full one that is ideal for taking a nap. The wide and curved armrests are also perfect for you to make the best out of your relaxing time. Featuring thick, generous padding, this recliner is comfortable while providing you the back support that you need. Plus, considering that it also features a very supportive headrest, you will be able to relax while preventing any further muscle pain. Those who need a generous seating area to relax might also appreciate this chair. It can hold on to a lot of weight – and it has been constructed well-enough to last through a long time of heavy use. The upholstery is made from a leather-like fabric that is very easy to clean and is also very durable. This way, even if substances are constantly spilled on the surface, the recliner will not lose its charm – and can look like new for a long time, with the right maintenance. The recliner has been generously cushioned, the deep plush allowing you to rest and relax. At the same time, while it may not have any fancy lift options, it is still very easy to get off this recliner. If you are looking for a budget recliner that looks pretty much like an armchair, then this one is certainly the one you could go for. The name of this recliner type actually gives away its basic function: to shift between two positions. To put it plainly, you can either go for an upright or a fully-reclined position. Most of these recliners use a lever to put it into its reclined mode – but if you go for an electric recliner, you can do that with the press of a button. Since they do not have so many extra features or reclining positions, these recliners are likely the cheapest in the batch. They are good for those who are shopping for recliners on a budget – but bear in mind that you might also be sacrificing on their functions. No, these recliners are probably not the rockers you are thinking of – but they are certainly more comfortable and convenient than two-position recliners. Simply put, a rocker will have several positioning angles. For instance, the footrest can go all the way up, but the back can be set only a few inches lower. They are appropriate for small rooms since you can place them relatively close to the wall. 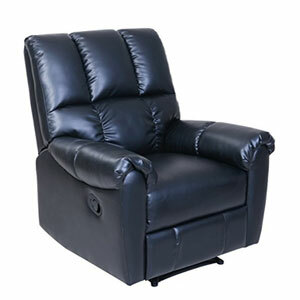 While a rocker recliner generally has a footrest, a push-back recliner usually does not. 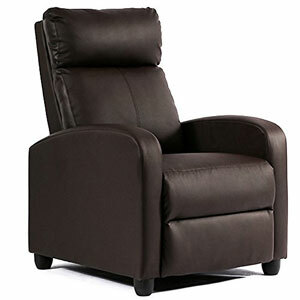 Also known as a flex-back recliner, this is a type that will have you pushing back into the seat when you want to get into reclining position. Considering that the back is the only chair part that actually moves, this type is perfect for smaller rooms. Plus, if you need a footrest, you can easily pair it with an ottoman to meet your needs. 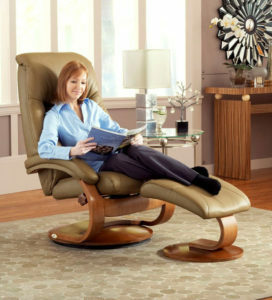 A riser (lift) recliner is simply a motorized reclining chair that will lift upward and recline. 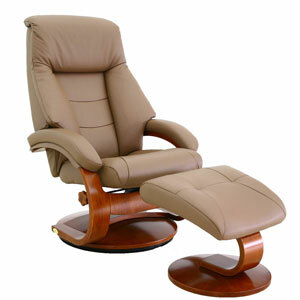 It is a good option for the elderly since it allows them to get out of the chair effortlessly. At the same time, they are the most expensive of the batch, but they are useful for those who have disabilities or difficulties moving. Wall huggers are some of the best options if you live in a home that is relatively small. Simply put, when this chair “reclines,” the seat will be pushed forward. As a result, you will be able to place this chair much closer to the wall. Not only does it save you space, but it is also generally compact and easy to use. Just as their name suggests, these recliners are supposed to be just that: big and tall, and extra larger. Designed to hold more weight compared to your average recliners, these are perfect for those who have a little more “honey” on their hips. Before buying a recliner, there are several things that you might want to keep in mind. Neglecting them may end up in you buying the wrong recliner – one which you may not even be able to use. The worst thing that you can do is probably buy a recliner that will not even fit in your room. And by this, we do not mean its non-reclined position. Sure, it might look all nice and compact when it is all “packed up” – but once it has been reclined, you might realize that it takes more space than you actually thought it would. To prevent such an unfortunate scenario, you may want to measure the size of the room, and then the recliner. Make sure that you measure the chair when it is also reclined. If you are buying the chair online, make sure that you are checking for dimensions. Bear in mind that every recliner will need somewhere between 1 and 3 feet of space from your room’s wall. Considering that this will vary from recliner to recliner, you may want to ask the salesperson exactly how much it reclines. Wouldn’t it be awkward to buy a recliner only to realize that you do not fit in it? It can also be problematic if the chair is too big. Since you cannot reach the armrests, you will basically be flailing about, without any support. If you cannot test the recliner yourself, measure yourself as you are sitting – and then look for the seat measurements. You might want to look for a recliner that has a couple extra inches to your size. You might also want to ensure that your head fits comfortably the headrest and that the feet are nicely placed on the footrest. The construction of the chair is also very important. First things first, look for heavy screws – since you do not want your chair to be falling apart after just a few reclines. You will want something that will last through time. Furthermore, look for recliners that feature a quiet motor. Let’s say that you are sitting in your recliner, and you feel yourself dozing off. You reach for the lever to recline – but the loud noise of the motor wakes you up and destroy every chance of getting some sleep. The cushion is also very important. Look for recliners that are soft enough to be comfortable – but also firm enough to offer the proper support. Last but not least, look for easy-to-use handles. You don’t want to turn your reclining session into a battle – so make sure that it is positioned somewhere that you can easily reach it. You’ve decided on the type, and you have considered the things of importance when picking out the perfect recliner. Now, you have to look for some extra features that you might want to have on your recliner. If you are lucky enough to have all these features in a chair, then you may have just found yourself the perfect recliner. Not every rocker chair has an actual rocker feature. However, some of these recliners have the option of rocking back and forth – just like an actual rocking chair. It is the perfect option for those who have problems falling asleep – and it is also ideal for mothers who are nursing their children. This type of recliner is a good option if you want to swivel around or pivot in your chair. You will be able to face any direction you want – or even start rocking if the swivel is balanced enough. If you have the budget to spare, nothing beats a massage option in a recliner. Think about it: you are already relaxed enough in your reclining position. Thus, adding a massage in the mix will feel as if you just reached heaven. So, why not get a recliner that will massage you with just the press of a button? 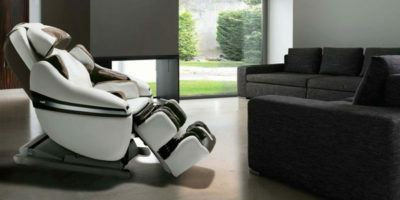 The massage will technically be a vibration – and depending on the chair, it might feel different from model to model. Ideally, you may want to test the chair before buying it – but if you can’t do that, you may want to get a chair with multiple massage speeds. The standard recliner will have three speeds: low, medium, and high. You can also go for reclining chairs that will massage certain body areas – such as your neck and shoulders or your feet. They may be called recliners, but not all of them have a flat lay option. Most of them recline to about 45 degrees. So, if you want to recline in a flat position, you may want to ensure that your recliner goes all the way from upright to flat. They are the perfect option for those who enjoy sleeping in their chair. Sometimes, when watching a movie, you might need a cup holder for your coffee or a pocket to put your remote control. If you tend to “hoard” around you, make sure that the recliner also has enough storage space. Don’t you just hate it when your phone battery runs out, and you have to leave the comfort of your chair to reach an outlet? Also, in this case, connecting it is not really the problem – but if the outlet is not anywhere close to the chair, you will have to stay phoneless as it charges. If you buy a chair with a built-in charger, this should no longer be an issue. You can charge your phone – and use it – while being in the comfort of the chair. Electric vs. Manual Recliners: Which One Is Better? The main difference between an electric recliner and a manual one is exactly in their name. An electric recliner has a power mechanism that allows you to adjust the chair using electricity. 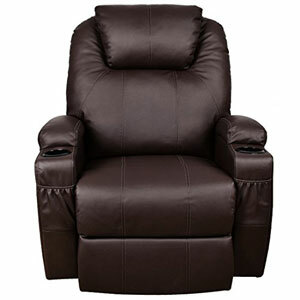 Cost: Electric recliners are generally packed with extra features, whereas manual recliners have no electric component. For this reason, a manual recliner will be much more affordable to purchase. Maintenance: Electric recliners are susceptible to failure or damage with their components, which is why they may require more maintenance. 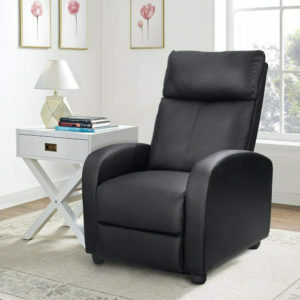 Manual recliners are relatively straightforward – and generally, require little maintenance. Versatility: Likely one of the best things about an electric recliner is that there are various settings and features that you can go for. From massages to charging features and so on, an electric recliner may give you more than the standard manual recliner. Longevity: Power recliners do not deal with as much wear as a manual recliner, which is why they tend to last for a longer time – provided they are given the proper maintenance. In the end, choosing the best recliner for your purposes will depend on what you actually consider a priority. Sleeping in Your Recliner: Are There Any Health Benefits? A mattress is a good place to sleep – but if you have an issue that calls for the above benefits, you might reap more benefits from sleeping in a recliner. When sleeping in a recliner, you need to set the heights right. The good thing about recliners is that most of them feature a footrest as well, allowing you to prop your legs up. If you are a pregnant woman or a person suffering from back pain, this is actually highly convenient for you. You might also want to ensure that the recliner has the right bedding. Not only will it keep you warm, but it will also ensure that you sleep better throughout the night. It is important that you choose a warm blanket if you want to sleep comfortably. If you need further support to sleep comfortably, you might want to use a pillow under your neck, and an extra pillow under your knees. Once your feet are elevated, you will get to sleep more comfortably than you would in a regular bed. Ideally, to sleep better in a recliner, you should also ensure that your room is not illuminated and that all your electronics are turned off. This way, your sleep won’t get interrupted by any potential light sources. Is Sleeping in a Recliner Bad for Your Back? Recliners can be a hit or a miss when it comes to back support. Some recliners may help you sleep better, with proper back support – whereas others will make you feel as if things have just been made worse. The answer lies in whether the recliner gives you enough lumbar support or not. So that your lower back is not strained, the recliner will have to fit your body properly as your feet are brought above heart level. Sleeping in a recliner is bad for your back only if you do not get proper lumbar support. Thus, you must check that it has the adequate support so that your muscles do not tighten and stretch as you are sitting. Is a recliner a good thing for your back? Yes, a recliner can be a very good thing for your back – but only as long as you pick one that has a lumbar support feature. This means that your recliner must have a massage cushion in the lumbar area of your back, allowing no gaps between your body and the recliner’s backrest. How should I clean and maintain my recliner? You can clean your recliner just as you would clean a regular piece of furniture: with mild soap and light scrubs – ideally, only when you see that the recliner has been stained. If your recliner is made from fabric (and not leather), you can take a soft brush and then brush away all traces of dirt or pet hair that might stick to its surface. How many positions does a recliner have? This will actually depend on the recliner – namely, the type that you purchase. For example, a standard recliner will only have 2 positions – but a more advanced recliner may have 3 or more. Depending on how much you want to invest, you might even be able to get a recliner with infinite reclining possibilities. This way, you can adjust the positions until you have found the perfect one for you. Is the fabric important when I’m picking out a recliner? Picking out the right fabric is actually something many people seem to neglect. You need to consider how much time you are planning to spend in that chair, the season, and how breathable it actually is. For instance, it might be difficult for you to sit for a long time during summer on a leather recliner – which is why you might want to go for a microfiber one. At the same time, you need to consider the environment. If you predict that many drinks or foods are about to stain the chair, then leather-like materials might be much easier to maintain. Do all recliners go into a fully reclined position? No, not every recliner goes into a fully reclined position. Some may recline at around 45 degrees or more – but never at a full recline. If you want your recliner to allow you to lie completely flat, you should check that it has this option first. Otherwise, you might realize that you have purchased a recliner for you to sleep in – but you can’t sleep in it at all. Can sleeping in recliner help sleep apnea? When you’re done, read our best heating pads round-up. Finding the most comfortable recliner is certainly not easy. For some, the most crucial part is the back support while others consider the cushion softness to be the most important aspect. There are also some people who believe that as long as the recliner has enough storage space for snacks, it’s perfect. It is all about the priorities that a particular person has. Needless to say, you need to know exactly what you are looking for in the most comfortable recliner before making the purchase. Otherwise, you might end up buying something that is very comfortable for you – but not so much for the rest of the family. Having said that, we hope that our guide helped you find the best recliner for your preferences. Some of the suggestions provided are more appropriate for watching TV or taking power naps – whereas others are the perfect choices for a few hours of rest. You just have to decide what you need the chair for.